Eye To Eye: Photographs By Graham Nash will open at the Morrison Hotel Gallery New York City location in SoHo, with a special invitation-only artist's reception on Thursday, April 19, 7-10 PM, followed by an official public opening on Saturday, April 21, 11 AM-7 PM. 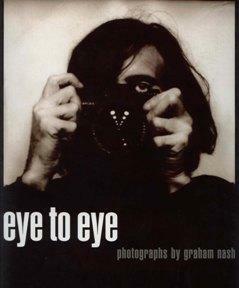 The exhibition, running through May 20, features approximately 40 images from Graham Nash's book Eye To Eye. The images on display will focus on Nash's portraits of celebrities and fellow music icons including, Judy Collins, Cass Elliot, Allan Clarke, Jackson Browne, David Crosby, Stephen Stills, Neil Young, Dennis Hopper and Joni Mitchell. Various signed limited and open edition prints will be available, all printed by Nash Editions, the fine-art digital printmaking studio Nash co-founded with R. Mac Holbert. Also on April 21, Nash and Holbert will speak at the Apple Store SoHo (103 Prince Street). In 2005, the Smithsonian's National Museum of American History placed Nash Editions' first IRIS 3047 inkjet printer in its permanent photographic history collection, along with select prints from the Nash Editions archive. Later this year Eye To Eye: Photographs By Graham Nash will also be presented at Morrison Hotel Gallery's two southern California galleries in Hollywood (on the Sunset Strip) and in LaJolla (in the San Diego area). Earlier this year, Graham Nash participated in photo l.a. 2007, a very popular photographic art expo in Los Angeles. I was very pleased to have been able to purchase a signed copy of his book Eye to Eye at that event. I hope to see this exhibit later this year when it comes to Los Angeles.